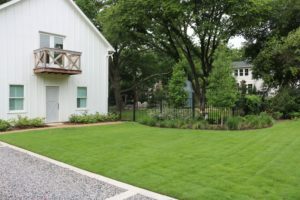 Chemical Applications – Great Gardens, Inc.
A lush green lawn is without a doubt a huge factor in a house's curb appeal. It is not enough to mow and edge you need to treat your lawn to achieve that beautiful, healthy look. At Great Gardens we offer a alternative to harsh and often toxic chemicals to make your lawn green. We use Holganix, which is a 100% natural bio-nutritional product. Using natural ingredients, Holganix increases the plants resistance to disease and insect damage. Additionally it enables the plant to more efficiently absorb beneficial nutrients and pesticides. To read more about the Holganix products and their benefits please click on the link below. To see a list of the ingredients in Holganix and what they are used for please click below. We have made a commitment to reduce our impact on the earth. Holganix is a non-poisonous, food grade product that is safe to enter the water table and it reduces the need for chemical fertilizers, nitrates, phosphates and pesticides on your lawn by 90%. This makes your lawn a healthy and happy place for your children and animals to play. By using this product you a making a conscious decision to help clean up our lakes and streams and to make this plant safe for wildlife. Affordable and environmentally healthy. What could be better?